A move to New York has helped Eternanda Fudge really go places – even if not quite in the ways she might have originally hoped! She hit the Big Apple with the dream, shared by so many, of getting a break in the media or showbiz. “I came here to pursue a career as an actor, a singer and a writer,” she said. However, this 33-year-old is made of tough stuff – and knowing that she had to earn money to be able to afford to continue living in Brooklyn, but also that she loved travelling, Eternanda set out to find ways of combining the two. “I just Googled ‘Long-distance trips to make money’, and that was how I found Citizenshipper!,” she said. “But I was pretty scared at that stage, not really knowing what I was letting myself in for – so I went onto Facebook to look for reviews. And well, you know, it’s full of people who just like to complain. So Eternanda returned to Facebook, and started getting in touch with a few other drivers who were already signed up and working regularly through Citizenshipper. “They just said ‘Give it a chance’,” she recalled. “I decided from the start that I would base which jobs I would bid for on them being places where I would like to go. I restrict myself mainly to the East Coast, as where possible I will try to pick up and drop off in the same day. But I can now say that I’ve visited every state along that coastline. At the time of writing, she’s completed 20 assignments, and says there are at least as many more in the pipeline. Eternanda soon learned that regular communication with her clients was fundamental to ensuring a successful job: “Apart from always ensuring the safety of my pet passengers, I found out early on that good communication is absolutely vital. Eternanda Fudge just loves driving and taking special care of her customers’ dogs along the way. 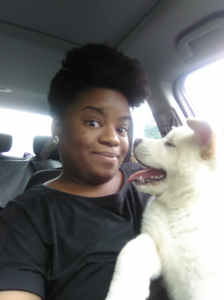 Eternanda’s trusty 2014 Honda Civic is clearly becoming a regular and dependable mode of pet transportation, and she’s pleased that there’s enough space for her to be able to transport dogs of most sizes – she doesn’t, though, transport cats, due to an allergy. “Having a medium-sized car like this means I can’t fit too many animals in – but my customers like that, and it means I can give each customer the ‘timely, responsible, nurturing and courteous’ transport service that I promise right there on my profile,” she says. As with many of our drivers, Eternanda keeps clients regularly updated through anything from a cellphone call or text message giving them an E.T.A., to Instagram or Facebook posts where they’re happy for these to be shared. With modern technology helping her stay in touch, she feels that it’s good to be able to get the most from it, and It makes it possible for her to give the level of service that her customers so clearly appreciate. She may not have any animals in her life outside work, but is sure that, from all her feedback, and the fact that she has such a blast when she’s in their company, that she has a “special bond” with them. “It’s just that I don’t think it’s fair for me, as a ‘poor starving artist’, to take on all that responsibility. “So I prefer to confine my love of dogs to the time I spend with them on the road, and then I can let them, and the experiences I share with them, be my muse and inspire me when I get back home, and I sit down to write, or paint. “Equally, transporting dogs around the country makes me appreciate its beauty and variety – and it helps make sure that I can continue to enjoy a better life in New York, and still have a whole lot of great experiences outside of it. “But as far as the dogs are concerned, I love meeting them all and making friends with them – and then I get the best feeling of all when I’ve handed them over safely at the end of the journey. And while people may, occasionally, not quite get her name right, Eternanda has clearly quickly made that name stand for a lot of the good things that Citizenshipper is all about – personal service, attention to detail, and a high level of commitment to ensuring that every customer is left happy, and willing to spread the word about the valuable services she is providing. So when you need a reliable and safe pet shipping partner to care for your precious babies, or your trusty old companion, you can find them through Citizenshipper. 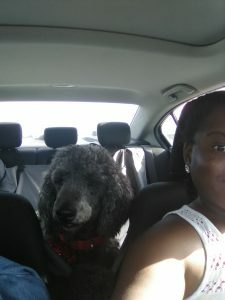 Eternanda strongly believes that a comfortable, relaxed dog makes for an ideal traveling companion. 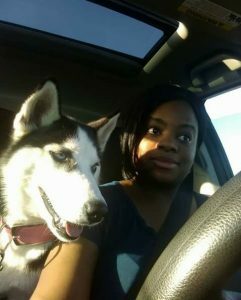 This entry was posted in Pets and tagged dog shipping., eternanda, Pets. Bookmark the permalink.